DNForum, the domain name forum and domain investor community owned by Adam Dicker, went dark sometime in early February. At the time, the DNForum owner stated that DNForum.com was undergoing server upgrades. Many expected downtime to last a few days. After several weeks and months passed, DNForum remained offline. There was some speculation over whether downtime was related to unpaid server bills, but it seems that Adam Dicker is now determined to reverse this. 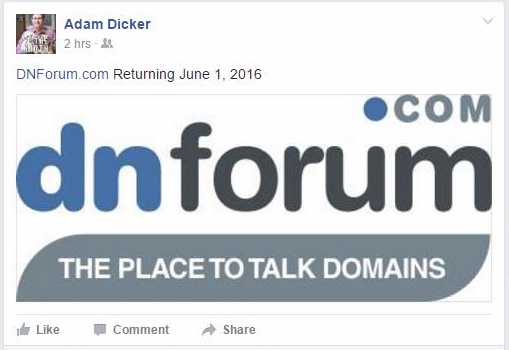 In a short post on his Facebook yesterday, Adam Dicker announced that DNForum returns on June 1st, 2016. At this point, we aren’t sure how much of its former glory will be recovered, as domain investors have flocked to arch-rival NamePros. Some domainers have quit visiting domain forums altogether. By keeping DNForum.com offline for several months, a marketing campaign will be needed to restore the traffic flow. Would you return to DNForum if it opens up again? Update – DNForum is now parked at Sedo with a zero click lander. I would never support anything with Adam Dickers name, or even the thought of his name attached to it, even a phony sale of DNF I would not support it. To take all these people’s feedback, and contributions who have supported such a grass roots site offline like that after so long is just a slap in everyone’s face, nothing to do with the people that are owed money, at this point anyone who contributed to that site is owed something. Adam Dicker is best to quietly sell his domain names, and live his life, anything public will be shamed, and ridiculed to the T.
I don’t care what Adam Dicker has done, personally. I have had hundreds of transactions on DNF with some of the nicest, most honest persons I’m lucky to ever have met. For me, DNF is a valuable resource that I will hang on to for as long as it’s there. I really like NPs as well, but for pure business, DNF has always been on another level. Only a fool would have anything to do with that guy. It was unpaid server bills, no speculation needed. Adam is incapable of being honest or forthright about anything. He offers no apology or explanation other than the initial lie of “server upgrades” when the forum goes down for months, and now he claims to revive it again? First, I’ll believe it when I see it…. The dude has a history of making promises and then disappearing. Second, even if dnf does come back, who could trust him as the owner? He has neglected and mismanaged it for years, allowing it to crash and burn, stopped paying his mods, and has been outted via the namepros scandal as a conman and a compulsive liar. Hopefully most sane people have the sense to stay away. I don’t know why the person above says DNF is a resource, it was at one time, it is now dead, it no longer loads, so everything that went with it is dead also. The feedbacks along with it, very sad, but do not hold onto it for the sake of memory, the people behind it are not to be trusted or supported. @Stian might be right but would it continue to be a valuable resource going forward? I seriously doubt it. Aside from all the other issues, I wonder if there is really much money to be made running a domain forum? DNForum died for a reason, no point bringing it back, it was a mess. NAMEPROS.COM is the one I have always frequented. The audience there is very fair and give truthful feedback appraisal. I have found Adam Dicker’s members to be downright rude when appraising domains. It will be an uphill struggle if he can get this forum viable. It will be impossible to sell due to it being out of order for such a long time. Best thing he could do is sell it cheap to someone new with fresh ideas and eventually domainers and marketers will flock there. I have always preferred Namepros (and probably will always do), but DNF was a good alternative when there is nothing new at Namepros. No matter of (forever) ruined reputation of Adam at DNF are some quality members. Thank you very much, it was my pleasure. sorry adam owes me money, do you have his current contact info? How do members who paid for a lifetime membership get compensated for the down-time? Also bringing it back up is not enough. He needs to put out a plan on how it will relaunch, what upgrades have been made if it shut down for upgrades. Also, address the stories of his being crooked. This industry is filled with immoral characters. The trust in Adam is zero. How does a new member know if the fork over a lifetime subscription fee like I did, it will be there for a lifetime? I will NEVER frequent a website owned by an immoral crook. Sorry buddy, you blew it and do not deserve a second chance. I spoke with Adam in 200 about my idea for a domain name college and he said it was a great idea. Two weeks later he launches DN College. Coincidence? NO WAY… The right thing to do is bring small claims suits against him to get your subscription fee for violating the terms of a lifetime membership. Lifetime does not mean I will shut the site down for 6-months and you guys go FY. 200 should have been 2010 in my aforementioned post. “How do members who paid for a lifetime membership get compensated for the down-time?” I’m pretty sure crooks don’t do compensation. I doubt if he’s opening it. The announcement was probably a ploy to drive traffic to his parking page. Keep looking to see if it’s up yet and put more money in his pocket. DNForum ought to be resuscitated – but not under Adam Dicker’s management or ownership. For 1 thing, that’s bad business. When an executive at a company causes a scandal that distracts customers from what the company actually does, that executive should go away … utterly and irrevocably. Adam Dicker is the principle obstacle to DNForum’s success. His bad reputation interferes with the DNForum brand and undermines customer trust. Dicker’s mis-management resulted in the website going dark. And while the site was live, it partly served as a hunting ground for Adam’s predatory behavior. But listen, domainers, let’s not throw out the baby with the bathwater. DNForum itself was YOUR network, YOUR content, YOUR market place. Adam Dicker didn’t write your posts. He didn’t fill your inbox with messages from people you met. Should Adam Dicker be allowed to destroy what ordinary domainers created? Adam Dicker didn’t build DNForum. He simply bought it, messed it up, and remains in the way. Dicker is an interruption. 4. Adam Dicker owes people money, and repayment is more likely if he’s permitted to sell off assets such as DNForum. Can’t get blood from a turnip … Actually, DNForum is worth more to Adam Dicker once he himself steps aside. He can’t generate much income from a forum when domainers are boycotting it, when it’s a ghost town. But there are people in this industry who could revive DNForum once it is disentangled from Adam Dicker. Domainers built DNForum. No 1 person should destroy what they built. “principal” not “principle”. Damn my mother tongue! There are too many forums. I don’t know why we need DNForum? The fact of the matter is that DNForum was dead for at least a year before Adam Dicker ran into problems. Anyone on DNForum in the year prior to the scandal was well aware that it was dead. Even if DNForum came back, it wouldn’t change the facts: it was a ghost town. In my personal preference, I never liked there being two big forums because everything was split across them and most of the members were on both sites anyway. I’ve seen it said for years how nice it would be if there was only one place and it was true now that it’s just NamePros. Adam has not been entirely honest with us, Adam owes a lot of money to a lot of people, I know some of them, just read few post in Namepros about it. @Logan DNForum was once an awesome place. It tanked. Everyone moved to NamePros. NamePros could tank too, especially with an absentee owner, then where would anyone go? Competition is healthy. @Joseph Peterson Your long ranting posts are not based on historical reality. @Bill I know it was. AFAIK, when a site tanks, that’s when there is an opportunity. Not while it’s thriving, that’s an impossible uphill battle unless you do something different to stand out. But there are plenty of alternatives if that ever happened again, just Google “domain forums” and scroll through the pages. Really, the biggest difference I’ve seen between NamePros and DNForum is that NamePros has an active team on the board: Eric, Michele, David, Paul, Raymond, etc. Whereas DNForum was a one-man show with Adam: that’s not sustainable and what I believe led to its downfall. That’s my take on it. I love blogs and forums because they help us all stay informed and spread our collective experiences. They will always exist. I’m not worried. DNForum.com Is OPEN! – The Place to Talk Domains! Please feel free to use the forum now. We are adding many new features in the next week, our official launch will be June 1, 2016. All existing passwords will work. Kate – Thanks, same here. My position has not changed, and everyone should make their own educated decision. Simply reporting the news. How do members who paid for a lifetime membership get compensated for the down-time? Adam Dicker is a faud!!!! He owes money to many people!. Adam owes me money too! He made promises and couldn’t keep them. He is a disgrace to domaining!. Steve Borbas and Victor (same IP) – Did you file a lawsuit?